These photographs were taken by my Grandfather, Howard Clark, while he was a Presbyterian missionary to the Navajos on their reservation at Window Rock, Arizona. The negatives are 3¼ X 5½, and they were copied by sandwiching them between glass plates and illuminated from behind by a diffused ring flash and photographed using a Canon 5D and Canon 100mm macro lens. The resulting images were inverted and the levels adjusted in Photoshop CS3 and Adobe Lightroom. 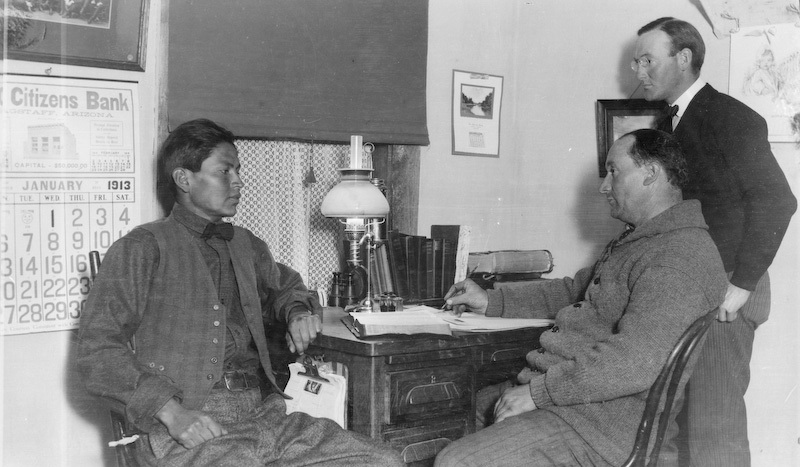 Most of these shots seem to have been taken around 1913, as you can see in image of the Navajo man seated at a desk in front of the Flagstaff, Arizona Citizen's Bank calendar for January, 1913. That shot, when seen at full resolution (I posted here only 800-pixel images), shows a whole range of cultural and temporal icons - the ink well, oil lamp, binoculars, pen, postage scale, etc. The changes from that photograph's time to the present span only one long-lived person's lifetime! These shots are all copyrighted 2008 to Betty Von Gausig, my mother and Howard Clark's daughter. Requests for use or duplication of these images must be made in writing to Doug Von Gausig, Critical Eye Photography, by e-Mailing doug@criticaleyephoto.com. Click on a "thumbnail" picture on the left to see that image enlarged. Click on the enlarged image to see it bigger yet. 3.25x5.5 negatives shot by Howard Clark on the Navajo Reservation near Window Rock, ca. 1913-19 while he was a Presbyterian minister there. These negatives belong to his daughter, Betty Von Gausig. Howard Clark is the gentleman in the upper right. Bluetooth headset radiation and a much higher compared to a wired headset? Bluetooth headset radiation to human body harm is serious, a colleague had a baby, said that the radiation is bad to the body, bluetooth headset have so exaggerated? How to choose qualified bluetooth headset?